Class Of '88 Belgian-style Ale | Goose Island Beer Co.
Bottled 1/13/14; drank 6/24/15 @ California Split. Minimal white head; minimal lace. Peach & mild apple cider notes in the nose. Peach & mild apple cider flavors up front; no booze heat on the finish. A refreshing, faintly tart treat; I hope to have another soon! I guess it’s not a bad beer, though there’s certainly no "dessert wine flavor". Actually about the opposite with a slightly funky sour taste. Very short lived head. A one off for me. In any event, cellar cleaning and found this one that I'd not tasted. Pours a crystal clear gold with a fast fading head - not even lacing after the head fades. Smell of Belgian esters and carnuba wax with undertones of sweet citrus. Mouth feel is very tart and acidic. Very wine like and with a real champagne characteristic. I'm not sure if this is intentional. Flavor profile is interesting in that there is clearly grapes and a muscat characteristic. Actually tastes a bit like old wine. Very much a sour apricot taste is best description of complex flavors with a pucker character. I'm trying to like this one - just not sure. Not what I expected at all. Clean, salvating, pucker finish. Biggest criticism is that this tastes nothing like a strong ale. On the good side, you'd never guess the abv in a million years. Appearance- Cloudy golden peach, no head to speak of. Taste- sour to me, more wine like than beer, carbonation similar to DP champagne with a cider base. No hint of the alcohol which is nice considering it's 11.2%, very balanced flavor throughout. Don't think I would ever drop another $20 on this. I love this beer. I have had 2 bottles under the Deschutes label and at least 6 by Goose Island. They are completely different in my opinion, the Goose Island being the superior of the two. Slightly tart, extremely refreshing. This beer is a must try for anyone who loves wine and beer equally. Take your favorite wine and mix it with the best beer and you have something that doesn't sound spectacular but it ...if you get this save it for a real special occasion. 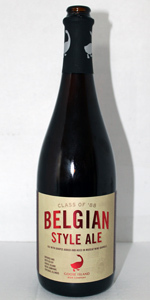 Class Of '88 Belgian-style Ale from Goose Island Beer Co.